Currently, Ethereum poker is on the rise. Ethereum (ETH) is one of the most popular cryptocurrencies in the world. It’s has a market cap of over $50 billion, which is only second to Bitcoin. It isn’t as widely used as BTC when it comes to online poker sites but it is technologically superior in many ways. 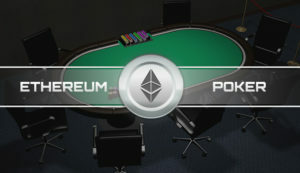 Ethereum poker may become more popular if Bitcoin falls off its perch or ETH becomes more popular with online poker players. Why Use Ethereum While Playing Poker? Ethereum is one of the faster cryptocurrencies and most advanced. It will typically beat Bitcoin and other coins when it comes to processing transaction speeds. It’s not as widely accepted as Bitcoin, Bitcoin Cash, or Litecoin, but it would be our first choice if an online poker site accepts Ethereum. Playing online poker with Ethereum on the internet is not against federal law in the United States, no matter where you are playing from. This is the same case for any other cryptocurrency or if you’re playing with U.S. Dollars. Amazing Technology – It’s one of the best cryptocurrencies out there when it comes to speed, fees, and processing time. All cryptos are faster and offer advantages over traditional fiat currencies, but ETH is one of the most advanced. Free Payouts and Speed – Almost all Ethereum gambling sites won’t charge fees for processing deposits or withdrawals. These are processed within 24 hours at most and in many cases, just a few hours. That’s a pretty drastic difference between paying $25 for a check by mail and having to wait 1-2 weeks. More Anonymity – Cryptocurrencies aren’t anonymous, but they still offer a lot more anonymity compared to using credit or debit cards or using your bank account. You’re not exposing any financial information when sending an ETH transaction or other cryptocurrency transactions. Not As Widely Accepted as Bitcoin – Bitcoin is accepted at far more gambling sites than other cryptocurrencies, including Bitcoin. In fact, Ethereum poker may lag behind Bitcoin Cash and Litecoin in this regard. However, there are still some excellent poker sites that accept ETH. Cryptos Are Unfamiliar – Using cryptocurrencies when you’ve only deposited using your debit or credit card after all these years can seem daunting. Using cryptocurrencies is easy, but it does take a bit of time to understand Ethereum and others coins. Price Fluctuations – Most gambling sites convert cryptocurrencies into USD or fiat currency once the funds are received. Usually, poker players are using cryptos as a means of moving funds and not holding large amounts of coins. However, price swings may not be ideal if you don’t want any risk of losing profits. Of course, this can also go in the other direction and Ethereum can gain value. SportsBetting.ag is an online poker room, sportsbook, and casino that is our top-rated options for U.S. players. They accept Ethereum and several other cryptocurrencies and have some of the fastest payouts online. Their poker site is among the largest for US players. New players will receive a 100% Poker Bonus up to $1,000 on their first deposit. BetOnline Poker has the same games and poker options as SportsBetting.ag. Payout speeds are also handled by the same staff. However, players can receive a bonus at both sites but they cannot play at each site simultaneously. Ethereum poker deposits and withdrawals are free of charge. Players can get the same 100% up to $1,000 poker bonus. America’s Cardroom takes over 60 different types of cryptocurrency, including Ethereum. ACR has some of the biggest tournaments online and the best cash game action. They have a VIP program, loads of contests, and a 100% Bonus up to $1,000 for new players on their first deposit. Buying Ethereum (ETH) is as simple as funding a digital currency exchange and connecting your bank account or debit or credit card and purchasing Ethereum or another cryptocurrency. There is a lengthy verification process at most exchanges, but once you’ve gone through that process, buying ETH or any other cryptocurrency can usually be done near instantaneously. The most popular cryptocurrency exchange is Coinbase. Transferring Ethereum is similar to Bitcoin or any other cryptocurrency. To send it from a wallet or an exchange, you must have an Ethereum address. When you deposit at a poker site that accepts this cryptocurrency as a cashier method, they will give you an Ethereum address and the amount of coins to send to the address (for example 0xe79c3300773E8593cdb332486W1EfdD8729b87445). If you plug your address into “Mist” –Ethereum’s user-interface software– you will be notified if an address is fraudulent. This isn’t necessary when dealing with reputable operators but can be when you’re dealing with an unknown vendor or person. You can opt to send a smaller amount first to be sure it gets to the correct address. If you want to convert your ETH back into USD once you receive them from an online poker room, it’s necessary to send it back to the exchange. From there, you can sell it back into your country’s currency, such as USD or Euro. Bitcoin Poker Sites – BTC is the largest cryptocurrency regarding market cap and the most popular at online poker sites. Litecoin Poker Sites – LTC is a near replica of Bitcoin, but offers faster transactions and lower fees. Bitcoin Cash Poker Sites – Bitcoin Cash (BCH) is a hard fork of Bitcoin but has garnered increased popularity in due it’s speed and low transaction fees.